Greenhouse Blues by Peter Reitsma. As an artist I imagine hope in the face of disaster. I would like to picture the land speak of the healing creator by pointing at economic injustice. 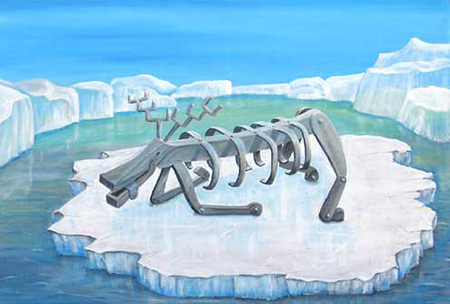 The metallic skeletal remains (As the deer pants for streams of water, Ps.41:2) is frozen in a position of need and supplication on a melting ice floe.